I don’t know whether to laugh, cry, or simply shrug my shoulders. Political books like this one often have the best of intentions, but when I put them down, I wonder if they really do no more than preach to the choir. Huffington expresses outrage at “corporatism” and the corrupt politicians responsible for screwing the Middle Class, and I share her indignation. But she undermines valid points by including anecdotal sob stories from “real people” that often seem one-sided and incomplete. Don’t some of these people share responsibility for their misfortune? Are they all complete victims? Huffington is also annoyingly repetitious; much of what she has to say is old news, but that doesn’t stop her from saying it – three times, if necessary. Still … her main arguments feel correct to me, and she provides resources for the Average Joe to take some kind of action, including a segment of her Web site, The Huffington Post. 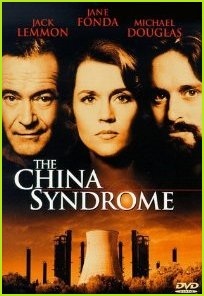 Back in 1978, very few people knew what the term “China Syndrome” meant. By the end of 1979, thanks to a nuclear accident at Three Mile Island and the release of this movie, everybody knew. (The term refers to a hypothetical meltdown releasing molten material through the earth’s crust, all the way from America to China.) Let Jane Fonda, Michael Douglas, and Jack Lemmon scare the neutrons out of you by watching The China Syndrome for free. Click here to watch. It’s hard to imagine anything more terrifying than being buried alive. It’s a legitimate fear because unlike, say, meeting Freddy Krueger in a bad dream, premature burial is grounded in reality. According to Wikipedia, George Washington so feared being mistakenly interred that he arranged to have his burial deferred until 12 days after his death. Over the centuries, this type of horrific error was not uncommon. Not to miss out on exploiting anything unspeakable, movies and TV are replete with stories depicting premature burial, from The Alfred Hitchcock Hour (“Final Escape,” 1964), to The Vanishing (1988), to Buried, now playing in a theater near you. And because this Ryan Reynolds showcase takes place in another waking nightmare, the Iraq war zone, Buried plays on even more nerves. 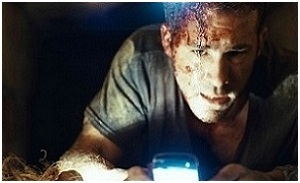 Reynolds portrays Paul Conroy, a truck-driving contractor in Iraq. 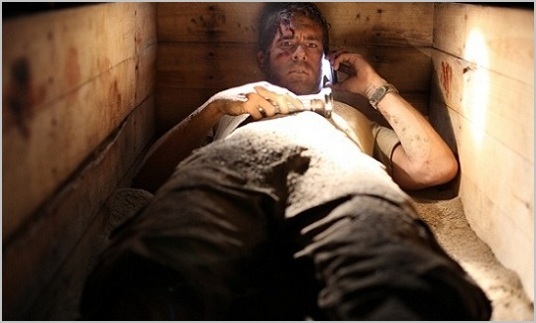 After his convoy is ambushed, Conroy wakes up in a wooden box, presumably six feet under. He learns that he’s been kidnapped (“one of the only functioning businesses over here [Iraq],” we are told) and deposited belowground by terrorists demanding a ransom. The entire 94-minute movie takes place inside his coffin – and that presents a challenge for director Rodrigo Cortes. 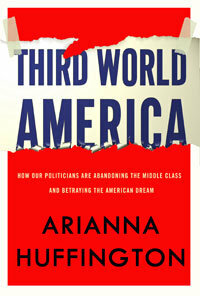 The horror of Conroy’s situation is obvious, but how to generate suspense from the situation? Through a cell phone, of course.